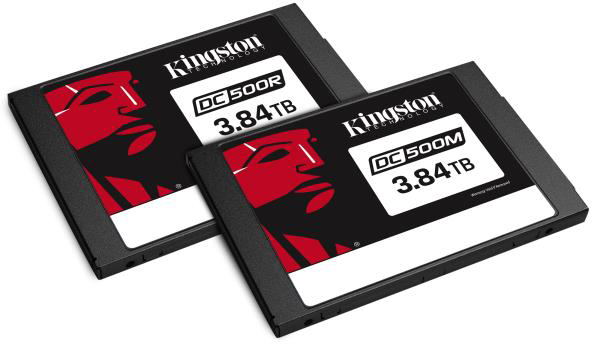 Sunbury on Thames, UK – March 18, 2019 – Kingston Digital Europe Co LLP, the Flash memory affiliate of Kingston Technology Company, Inc., a world leader in memory products and technology solutions, today announced its new Data Center 500 Series Enterprise SSDs. DC500R is optimised for read-intensive applications while DC500M is optimised for mixed-use workloads. Both SSDs in the DC500 Series implement Kingston’s strict Quality of Service (QoS) requirements to ensure predictable random I/O performance as well as predictable low latencies over a wide range of read and write workloads. The Data Center 500 Series is available in 480GB, 960GB, 1.92TB and 3.84TB capacities. For more information visit www.kingston.com. Optimised for read-intensive applications (DC500R): Responsiveness from low latency and consistent I/O performance delivers businesses the QoS needed in demanding read-centric workloads. Optimised for mixed-use applications (DC500M): An exceptional balance of consistent I/O delivery and high read and write IOPS performance to manage a wide range of transactional workloads. applications can leverage the predictable I/O and latency performance. safeguards against data corruption for end-to-end data protection. corruption on ungraceful power fails via power capacitors and firmware.